Thank you to Young Texans Against Cancer (YTAC) for granting His Grace Foundation $6700. That's 224 personalized shopping trips for patients and families on the Bone Marrow Transplant Unit! 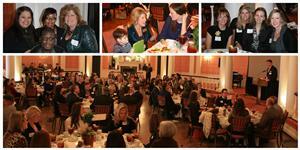 His Grace Foundation staff delights in keeping up with many former patients and families. We love to watch their lives continue to unfold far beyond the seasons spent at Texas Children's Hospital. 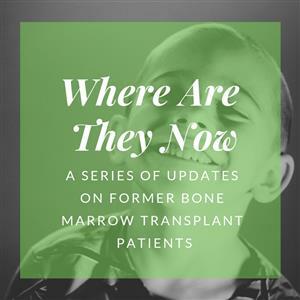 We are thrilled to announce the Where Are They Now series, which will offer you, our generous supporters and friends, a glimpse into the worlds of former bone marrow transplant patients. 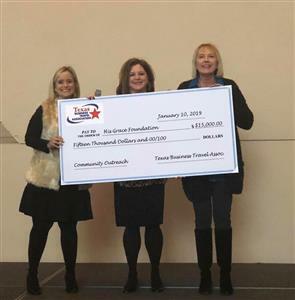 Thank you to Texas Business Travel Association (TBTA) for awarding His Grace Foundation $15,000 and collecting an incredible number of items for our patient and family welcome baskets. We are so grateful for your three years of generous financial support! In 2017, His Grace Foundation had the honor of giving a college scholarship to former bone marrow transplant patient Matthew Hogan through the His Grace Foundation Holly A. Hardy Educational Support and Scholarship Fund. 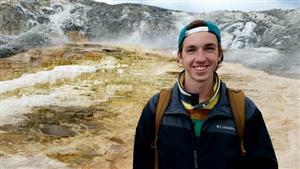 We recently had the joy of catching up with Matt about his experience in college thus far and his hopes for the future, and here's what he'd like to share with you! 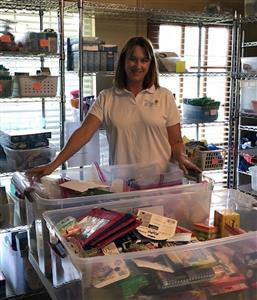 Every week, HGF volunteer Leigh Gose lends a hand at our office in Hockley where she stocks toys for patients and gifts for caregivers, organizes our many shelves, and makes tailored welcome baskets. Leigh also helps with our weekly shopping service and assists with HGF events. We are so thankful for her faithful service! 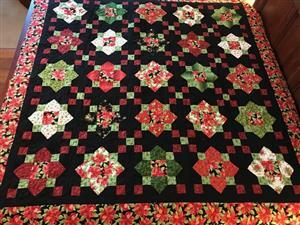 Save the Date: Online Christmas Quilt Auction Benefitting HGF! On Thanksgiving evening, His Grace Foundation will open an online auction for this gorgeous Christmas quilt created in honor of our namesake, Gracie Kiltz. The inscription is below. Save the Date for November 22-24 and get your bids ready! 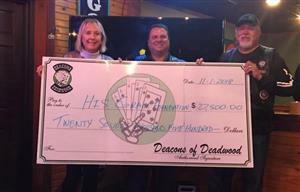 Thank you to the Deacons of Deadwood for a gift of $27,500 raised through their 17th Annual Charity Ball! We are so grateful for their continued generosity of His Grace Foundation as we provide physical, emotional, and financial support to patients and families of the Bone Marrow Transplant Unit of Texas Children's Hospital. We are heartbroken to share with you that Gracie Kiltz, the inspiration and namesake of His Grace Foundation, passed away on September 8. 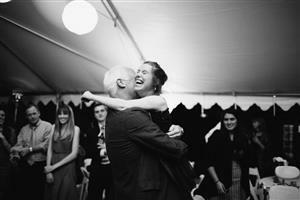 Our loss here on earth is profound, but we know Gracie is dancing with Jesus in heaven. All who knew Gracie are invited to a Celebration of Life service at Georgetown Church of Christ on September 22, followed by a reception and dance party at the Sheraton Georgetown. If you'd like to read more about Gracie's life, including the chapters that led to the birth of His Grace Foundation, we invite you to read her story here. Thank you to everyone who participated in our Summer Sunshine Event last weekend! 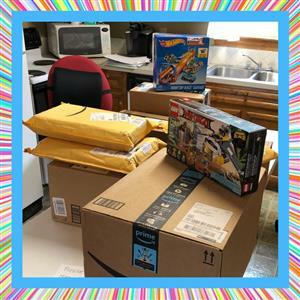 Boxes of welcome basket toys and games continue to arrive--we're so grateful. If you missed the event, you can still send a little something for a patient or caregiver straight to the HGF office to be added to a welcome basket! Find all HGF Amazon Wishlists at https://www.hisgracefoundation.org/DonateBasketItems.aspx. It was our delight to introduce Heisman winners Mike Rozier, Billy Sims, and Eddie George to patients and families on the BMTU. Everywhere we looked, we saw surprises and smiles. Thank you to everyone who made this special day possible! You can see more pictures on our Facebook page here: https://www.facebook.com/HisGraceFoundation/posts/2041044679249186. 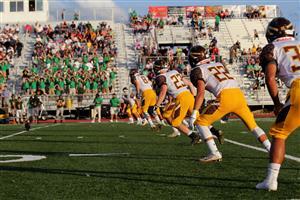 It's nearly Game Day in more ways than one! As football season begins and you prepare to have friends over for the big game, consider collecting board games for patients on the Bone Marrow Transplant Unit at your party! 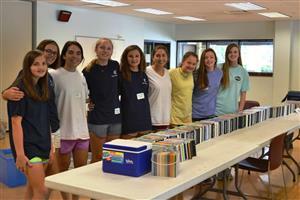 Ask your social or civic group to participate in a board game drive. You can also send a board game directly via http://bit.ly/HGFGameList. Listen to Travis Arnold, former BMTU patient, share his story of cancer, transplant, and life since then in this under two minute video! 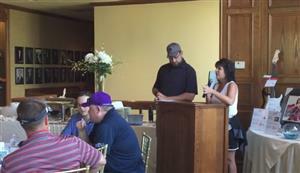 At the 2017 His Grace Foundational 19th Annual Charity Golf Tournament, Gina Arnold, mom of former patient Travis Arnold, reflects on her family's time on the BMTU and how HIs Grace Foundation served them. 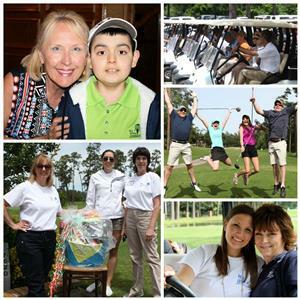 BMTU Patient Families - Join Us at the Golf Tournament! 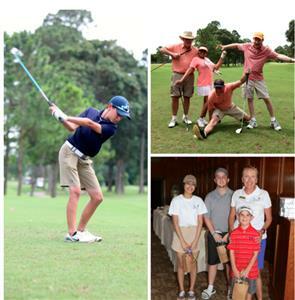 If you are a current or former BMTU patient family, we would love to host you at the 19th Annual His Grace Foundation Charity Golf Tournament on May 15th at Northgate Country Club. You are welcome to join us as early as 10am or at any point through mid-afternoon. If you have any questions, please email val@hisgracefoundation.org. We look forward to seeing you! 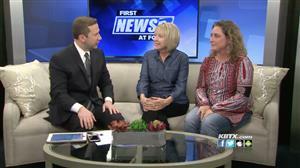 On February 16, Rusty Surette, News Anchor, welcomed Val Anderson, His Grace Foundation Executive Director, and Tracy Ash, Mom of Former BMTU Patient Colby Ash (pictured above), on the Focus at Four segment of KBTX News. Tracy told the story of Colby's transplant and how helpful it was to have His Grace Foundation alongside them during their time at Texas Children's. Val shared about HGF's twenty years of service and announced HGF's new Amazon Wish Lists which allow you - yes you! - to purchase items that will go directly into patient welcome baskets: https://www.hisgracefoundation.org/DonateBasketItems.aspx. On Valentine's Day 1997, His Grace Foundation began serving patients and families on the Bone Marrow Transplant Unit of Texas Children's Hospital. Over those two decades, we have served approximately 1800 families and expanded our services far beyond what we could have imagined at the beginning. Thanks to the generosity of so many of you, we were able to host an all day party for our 20th Birthday and Valentine's Day on the BMTU, celebrating with lunch, dinner, treats, gift bags, massage therapy, art projects, and professional photography. Thank you to volunteers from the Texas Business Travel Association, HGF Board Member and Volunteers Marianne Lines and Lory Whitley, HGF Program Coordinator Carolyne Digel, Nothing Bundt Cakes West University, Craig Brown Massage Therapist, Andrea Scott Photography, The Faulk Foundation, and volunteers Lynn Ripley, LaTonya Perez-Edmeads, and Ana Rizvi for coming together in support of His Grace Foundation. Your participation made for a day that the patients and families on the BMTU won't soon forget, and they join us in appreciation for your kindness. Want to see more beautiful images from the celebration? Check out Our New Amazon Wish Lists! One of our goals in 2017 is to increase our in-kind giving so that every dollar we receive in donations can be stretched even further. You can help us with this by purchasing small items for our welcome baskets via our new Amazon Wish Lists! Items are as low as $5, and every little thing has the ability to bring a smile to the face of a patient facing the last hope for a cure. Consider sharing these links on your social media feeds, or emailing them to a few friends, colleagues, or fellow community organization members who may want to partner with you in filling a basket! Help Us Celebrate Valentine's Day & HGF's 20th Birthday! February 14, 2017 is His Grace Foundation's 20th Birthday and we will be celebrating on the BMTU all day long. We hope to raise $2000 toward catered lunch and dinner, Valentine photography for the BMTU families, massage for parents and caregivers, and a dessert cart. 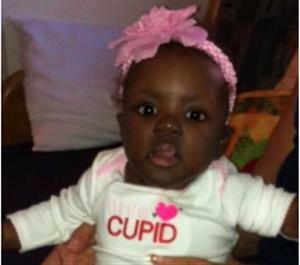 You can donate here https://www.hisgracefoundation.org/Donate.aspx and please note "Valentine's Day" in the comment box. We will recognize you or your company/organization with signage at the party as well as on our website and social media! 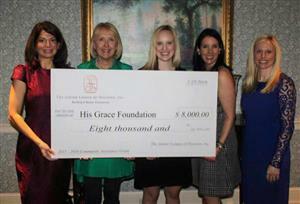 Thank you to the Charity Guild of Catholic Women for granting $10,000 to His Grace Foundation! As HGF approaches its twentieth birthday (just one week away! ), these funds will help us continue to ensure a legacy of hope and care for the patients and families on the Bone Marrow Transplant Unit. 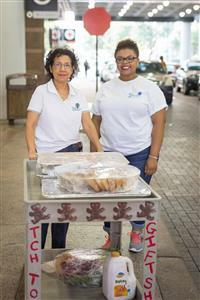 From parking to welcome baskets to meals to massage, our services are made possible by generous donors, and greatly reduce the stress and encourage the hearts of those staying on the BMTU. Are you interested in volunteering with His Grace Foundation? 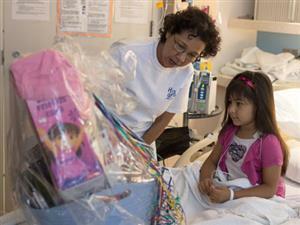 There are opportunities on the BMTU in Houston, or you can help with welcome baskets and more at our office in Hockley. 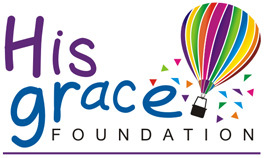 Sign up for a volunteer training and check out the list of volunteer opportunities here: https://www.hisgracefoundation.org/Volunteers.aspx. We're delighted to announce a new extension of our partnership with Teas Children's Hospital - The Quality of Life Program which will serve the patients of the Bone Marrow Transplant Unit at Texas Children's Hospital through hopeful and healing experiences. Long-term survivors will be invited to attend fun social events sponsored by the program, providing opportunities to spend time with other children and teens who have walked a similar road. Thank you to Chick-Fil-A Meyerland Plaza for hosting a Spirit Night for the program and donating a percentage of sales on January 16! Thank you to the Texas Business Travel Association for benefiting His Grace Foundation though their 2016 Charity Golf Tournament. Their generous support of $25,000 will ensure a legacy of hope and care for the patients and families we serve. His Grace Foundation along with other organizations at Memorial Drive Presbyterian Church on Sunday, 9/25, as one of the beneficiaries of their Outreach Sunday. 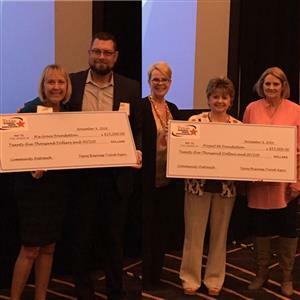 HGF received $5,600 that will help secure temporary post-transplant housing for BMTU patients and families who must stay within 15-20 minute radius of Texas Children's Hospital. Thank you to all who contributed toward our back to school drive! 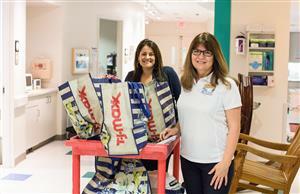 We were able to provide forty backpacks to patients both on the BMTU and in the outpatient clinic, as well as patient siblings. The backpacks were filled with pens, folders, paper, and other educational supplies. 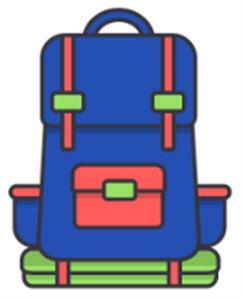 Some of the students who received backpacks were a part of the Summer Bridge Program, and the supplies they received directly helped them complete work and accomplish milestones that set them up to re-enter school on grade level, ready to succeed. We are so thankful for each of you who donated toward this specific need, helping us to stand in the gap for families whose needs are not only physical, emotional, and financial, but educational as well. For the children on the BMTU of TCH, keeping up with schoolwork can be an immense challenge, if not impossible. This summer, His Grace Foundation worked together with certified teachers to start the Summer Bridge Program, which provides tutoring and educational support to patients who would otherwise not have been able to promote to the next grade level this fall. The patients were provided with one-on-one educational support both in their hospital rooms and in the state-of-the-art classroom and library environment at TCH. 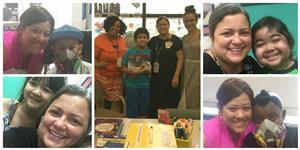 This pilot program served 10 BMTU patients, preparing them to enter the school year successfully. The Summer Bridge Partners are Texas Children's Hospital, His Grace Foundation, Faust Foundation, Harris County Department of Education, City of Houston Public Library Digital, Community Services of Houston Independent School District, and Volunteer Services of Texas Children's Hospital. The program was made possible by the His Grace Foundation Holly A. Hardy Education and Scholarship Fund. Thank you to Donna Shanklin, Tracy Cook, Maria Martinez, Keith Hughes, Demetris Williams, Raegan Cook, Sandra Trevino, Leslie Paredes, Regina Burdett for your critical role in this exciting new venture. Thank you to everyone - golfers, volunteers, patient families, and sponsors alike - who braved the heat on June 13th and joined us for the His Grace Foundation 18th Annual Charity Golf Tournament! We are delighted to have raised over $125,000 that will directly benefit the patients and families on the Bone Marrow Transplant Unit of Texas Children's Hospital. The golfers enjoyed a delicious breakfast from Kajun Asian on Wheels, golfed while enjoying refreshments from Gordon's, Karbach, and No Label Brewery, then placed their bids on exciting silent auction items like a guitar signed by members of The Eagles, vacations, and sports memorabilia. The day on the green was made all the more special by the opportunity to meet former patients and their families, including Briana Donis who shared her story with the golfers during lunch. It was also a joy to share our hopes for the future of HGF including more post-transplant housing and educational support, and to celebrate all that has been accomplished on behalf of the BMTU families. See you next year! The patients and families on the Bone Marrow Transplant Unit of Texas Children's Hospital join the HGF board and staff in thanking the Harry S. & Isabel C. Cameron Foundation for recently granting HGF $9,000. We are honored to have their support as we continue developing and implementing hope-filled, practical services. Thank you to QBE Insurance for supporting our mission with a a $10,000 gift! This generous donation will directly support the patients and families on the Bone Marrow Transplant Unit of Texas Children's Hospital, ensuring a legacy of hope and care through our core services of welcome baskets, weekly shopping and meal deliveries. The patients and families we serve join us in thanking QBE for their generosity! Thank you to The Junior League of Houston, Inc. for granting His Grace Foundation $8,000 toward furnishing of one of our post-transplant apartments! 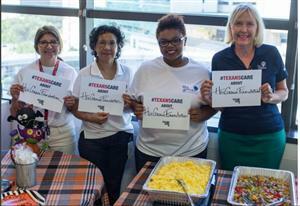 Thank you to the Houston Texans for choosing His Grace Foundation as a beneficiary of $2500 during their #TexansCare campaign! This donation will ensure a legacy of hope and care as we continue supporting the patients and families on the Bone Marrow Transplant Unit of Texas Children's Hospital. 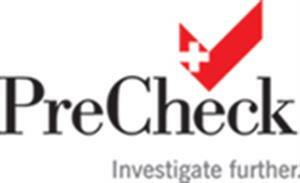 As an organization that services the healthcare community, PreCheck is committed to supporting patients and their families beyond the work that we do each day. 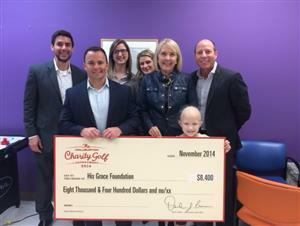 Last December, we had the opportunity to wrap up 2015 by supporting His Grace Foundation (HGF) and their efforts to provide physical, emotional and financial support for the patients and families on the Bone Marrow Transplant Unit (BMTU) of Texas Children’s Hospital. 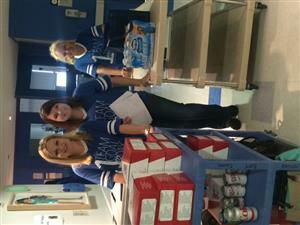 CWS Corporate Housing - Day of Service. Thank you to CWS Corporate Housing for serving His Grace Foundation by purchasing items and delivering them as part of our weekly shopping service for families on the Bone Marrow Transplant Unit at Texas Children's Hospital! 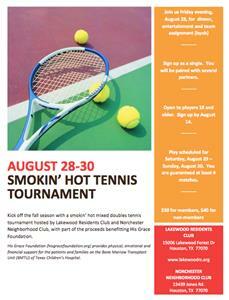 HGF was honored to be a beneficiary of the Smokin' Hot Tennis Tournament hosted by Lakewood Residents Club and Norchestor Neighborhood Club. Thank you to all who participated! This spring, we launched the Sunny Side Up Saturdays Program, which now provides weekly brunches to the BMTU. In that spirit, we are excited to introduce the What's for Dinner Wednesdays Program, an opportunity for you to be a part of bringing tasty, nutritious meals and genuine encouragement to families midway through their difficult weeks. A What's for Dinner Wednesdays meal consists of an entree, sides, dessert and beverage delivered to individual patient rooms. His Grace Foundation will handle all ordering and delivery. Sponsorship is $250 per dinner. Donations may be made on our website at https://www.hisgracefoundation.org/Donate.aspx (please include “What's for Dinner Wednesdays Sponsorship” in the comments). You may also mail a check (please include “What's for Dinner Wednesdays Sponsorship” in the memo line) to: His Grace Foundation P.O. Box 722 Tomball, TX 77377. What a day! 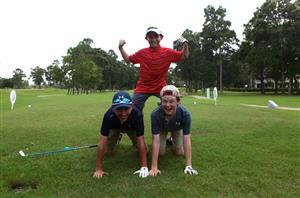 Thank you to everyone who participated in our golf tournament on April 20th at Northgate Country Club. To the golfers who played, patient families who attended, sponsors who supported and volunteers who gave their best toward a successful tournament, we are so grateful for you! The tournament raised $129,000, which will directly impact families on the Bone Marrow Transplant Unit of Texas Children's Hospital. We are honored to have the privilege of directing these funds toward the betterment of our programs and services. This year, we desire to expand our temporary housing options, grow our services for neonatal patients and increase our Family in Need Fund to provide greater financial assistance as crises arise in the lives of those we serve. Thank you to all who are helping make these dreams a reality! 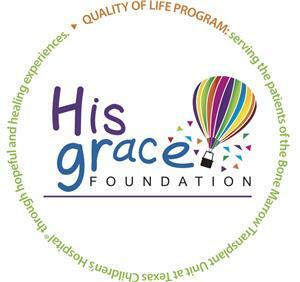 For 18 years, His Grace Foundation has provided physical, emotional and financial support to the patients and families on the Bone Marrow Transplant Unit of Texas Children’s Hospital. We are committed to serving over 150 families each year with delicious, healthy meals that offer a taste and comfort of home. As our program continues to grow, it is both a priority and privilege to increase the number of meals we serve each month. The Sunny Side Up Saturdays Sponsorship Program offers you the opportunity to participate with us in brightening the weekends of caregivers whose lives have been consumed by the needs of their critically ill children. Families must stay on the BMTU for weeks or months at a time, isolated from family, friends and familiar surroundings, with limited, often undesirable meal options. We have a great opportunity for ANYONE who desires to be a part of the mission of His Grace Foundation! CWS Corporate Housing has partnered with us to provide four drop-off locations throughout the Greater Houston Area to collect HGF welcome basket items. Each location has a specific list of accepted items, please see the lists below to determine the location nearest you! Invite your friends, co-workers, clubs, church groups and classes to participate with us and make a difference in the lives of patients and families on the BMTU. If you are in North Houston or The Woodlands, contact abby@hisgracefoundation.org for drop-off information. Join us as we start the climb to raise $135,000 for patients and families on the Bone Marrow Transplant Unit of Texas Children's Hospital. Registration for individuals and teams, as well as sponsorship opportunities are available on the page linked above. Join His Grace Foundation as we reach new heights on behalf of the patients and families on the Bone Marrow Transplant Unit of Texas Children’s Hospital. 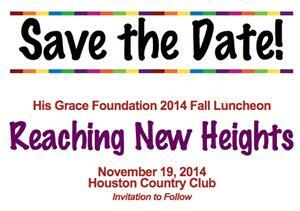 Thank you to all who attended, supported and participated in our 2014 Reaching New Heights Luncheon at the Houston Country Club! 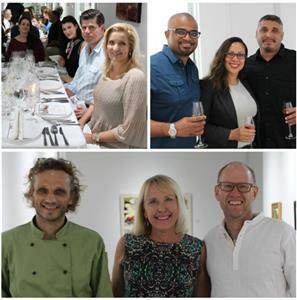 The event raised $84,000 which will directly affect the patients and families we serve - we are so grateful! The luncheon was joyful, reflective and inspiring as we celebrated all that His Grace Foundation has been privileged to do in the past year and all it hopes to do in the future. Tom Abrahams of ABC13 was our event emcee and shared the story of how he came to be connected with His Grace Foundation through a friendship with a patient family. Lindsey Boggan, the mother of two former BMTU patients, shared how HGF had personally touched her life and given her the encouragement to press on during hard days through small touches of personal kindness and provision. Val Anderson, HGF Executive Director, shared many of our 2014 accomplishments, such as increased housing for outpatient families, a renovated BMTU family room and refurbished His Grace Place. She also encouraged attendees to be a part of helping HGF meet new goals in 2015, goals such as introducing new services specifically tailored to families with infants receiving neonatal care, and enhancing patient exam rooms to make them more child friendly. Today, we offer you the same opportunity to be a part of helping His Grace Foundation reach new heights on behalf of the patients and families on the Bone Marrow Transplant Unit of Texas Children's Hospital. As the year draws to a close, will you consider a gift in celebration of all HGF has done with your support this year, and all we hope to do in the year to come? We are forever grateful for your generosity and partnership! 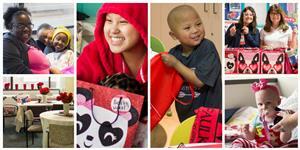 The patients and families served by His Grace Foundation join us in saying, "thank you!" to Halliburton for their generous donation! In addition to providing this wonderful gift, several Halliburton employees also took the time to visit the BMTU, meeting patients, parents and caregivers who will be direct recipients of their support. Thank you, Halliburton! His Grace Foundation would like to extend a huge "thank you!" to the Bayou City Chapter of the National Charity League (NCL) for collecting, organizing and donating over 400 television shows and movies to the entertainment library on the BMTU. 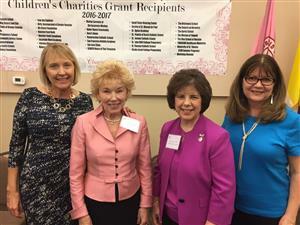 The mothers and daughters of NCL have been wonderful volunteers, continually seeking to participate in service and projects that will make a great impact for the patients and families we serve. This DVD library is no exception! 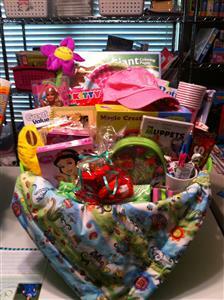 Thank you NCL for providing the perfect gift for families and children in the midst of difficult, mundane days. Adults and children alike are sure to love the entertainment and mental break the enhanced library will provide. As many of you know, HGF recently lost the free parking previously provided by a generous corporate donor. Thank you to all of you who supported our effort to find a new plan for providing free parking for the BMTU families. The Texas Children's Cancer Center will now provide parking for inpatient families with Monday-Friday arrivals. HGF will provide parking for extenuating circumstances, weekend arrivals and holidays. Thank you, Texas Children's Cancer Center, for working with us to provide this tremendous financial relief for the families we serve. 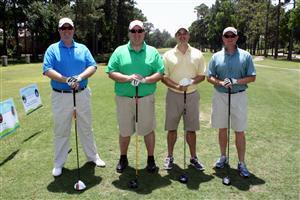 HGF 17th Annual Charity Golf Tournament Raises $110,000! 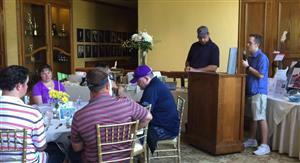 Over 190 golfers showed their support for His Grace Foundation on April 28th at our annual tournament. It was a beautiful, warm day and the players commented on how much they enjoyed the course and meal after the tournament. But most of all, they loved the opportunity to meet former patients and patient families that HGF has served, especially the chance to hear from patient father Steve Phillips as he spoke of the bravery of his son in the face of great difficulty, and the profound impact that His Grace Foundation had on their weeks and months spent on the BMTU. Thank you to each and every golfer for supporting HGF by playing in the tournament and participating in the silent and live auctions - your generosity makes a significant impact on those we serve! A special thank you to our wonderful sponsors! 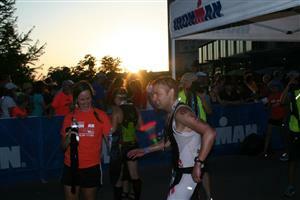 Thank you to Matthew Fish for competing in Ironman Texas on behalf of His Grace Foundation! Matthew wrote the following words about his race experience and passion for HGF. I wanted to take a moment and say thank you for everyone's support for Ironman Texas 2014 and most importantly for His Grace Foundation...I am so grateful that such a wonderful Foundation will be able to give just that much more to families who need to endure the most. Thank you again to everyone who helped push me across that finish line! My endurance for their endurance! Matthew raised over $1100 for His Grace Foundation, funds which will directly support patients and families on the BMTU. Thank you for your effort on our behalf, Matthew, and congratulations on achieving your personal best race time! 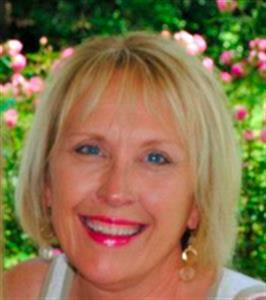 Congratulations to Executive Director Val Anderson who is celebrating 10 years with HGF. Among numerous other accomplishments, the foundation reached 501(c)3 status, has grown to provide outpatient housing and has greatly increased services to families on the BMTU while under Val's leadership. We asked Val to share with you her reflections on the last ten years of serving patients and families on the BMTU. What a joy and honor these past ten years have been. I am immediately overwhelmed with gratitude as I begin to think on all that God has accomplished through HGF during this season. I am so thankful to John and Erin Kiltz, my dearest friends, for entrusting me with their beautiful vision, believing in the foundation they had laid and my ability to build upon it. Their faith in me, in HGF and most of all in God's plan has spurred me on time and time again throughout these past ten years. I am also deeply grateful for our Board of Directors, Advisory Board, Volunteers, Supporters and Friends who partner with me in providing grace in the need of the moment to the precious families we serve. Above all, I'm beyond thankful to God for bringing every dream he planted in the heart of HGF to fruition and fullness. One of the most enjoyable parts of my job over these years has been cultivating HGF's relationship with Texas Children's Hospital, without whom we would not have this incredible opportunity to serve. As I've met with TCH Social Workers, we've been able to identify and fulfill specific needs for patients and families. Through working with the TCH Child Life Specialists, HGF has collaborated on and implemented activities and opportunities that brighten the days of patients during their long stay on an isolated unit. It has also been a great joy to work with our amazing core of volunteers, many of whom have served with us for years and are so diligent and consistent in their service. This close-knit group encourages me daily. One of the most exciting parts of serving as Executive Director is dreaming for the future of HGF. As I think on the next few years, I most look forward to finding ways to expand our post-transplant housing, to provide greater assistance to post-transplant families as they re-enter their day-to-day lives and to further our services in the outpatient clinic. We are pursuing the introduction of new facets to our program as well, such as music therapy for patients on the BMTU and college scholarships for former BMTU patients. These ideas and many more keep my wheels turning and heart beating for those we serve. Thank you all for each and every way you have supported HGF. It is an honor to serve by your side.